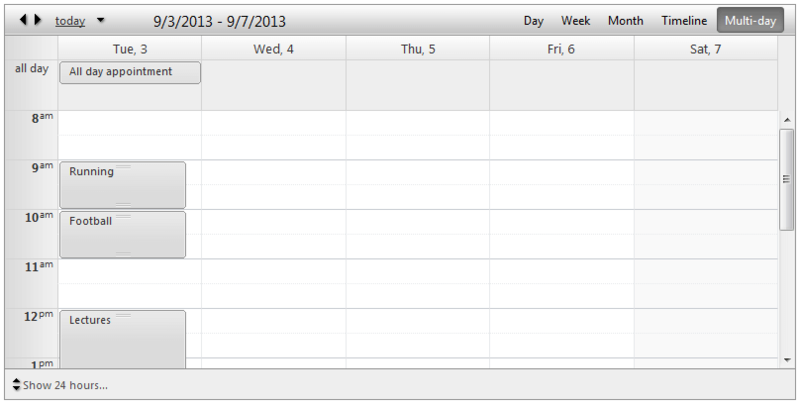 The Multi-Day View allows you to display a variable number days controlled by the property NumberOfDays. DayEndTime - Sets the day end time of the current view. 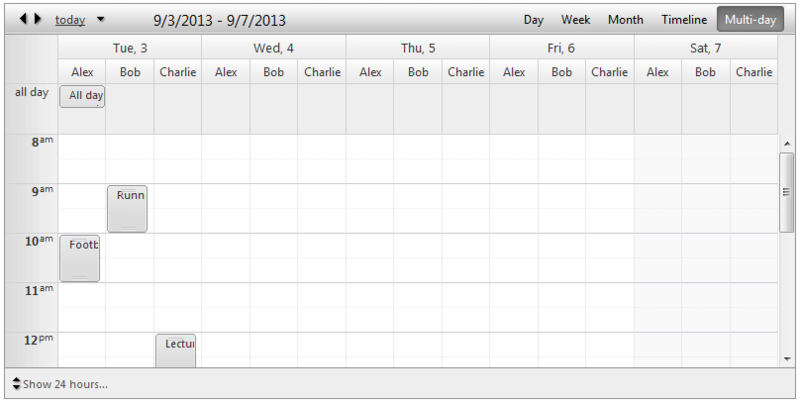 WorkDayStartTime - Sets the day start time of the business hours. WorkDayEndTime - Sets the day end time of the business hours. 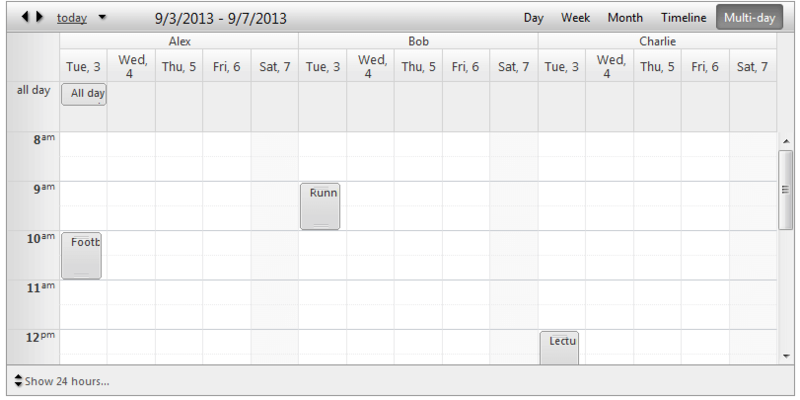 ShowAllDayRow - Shows/hides the all day row for all day appointments on the top of the calendar area. EnableExactTimeRendering - When it is enabled the appointment does not occupy the entire time slot if its start/end time does not match the time slot start/end time. The default value is false so the advanced edit form is the only way to determine what is exact appointment start/end time. ShowAllDayInsertArea - When enabled it keeps an extra space in the all day row where user to double click and have the ability to add an appointment. ShowHiddenAppointmentsIndicator - Indicates whether there is an appointment in current non-visible area. 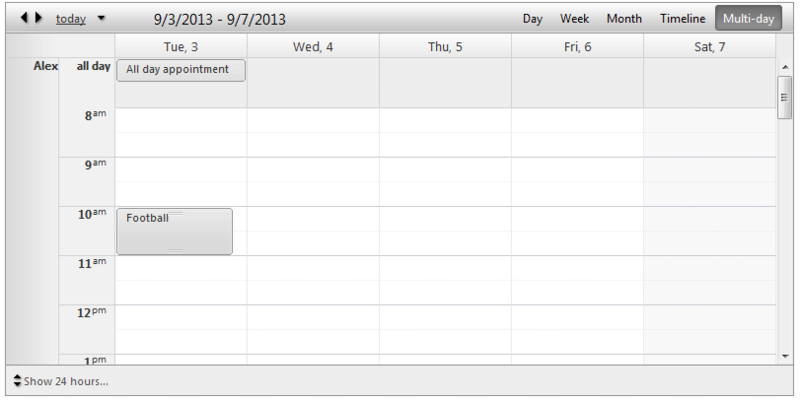 Clicking on that indicator will navigate to that area in order to show the appointment. ShowInsertArea - When enabled it keeps an extra space in each row where user to double click and have the ability to add an appointment. ShowHoursColumn - Indicates whether to show the hour labels on the left.